Cirque du Soleil. Those three words bring up images of dreamlike landscapes full of bejewelled characters performing spectacular feats of strength, flexibility and acrobatics. 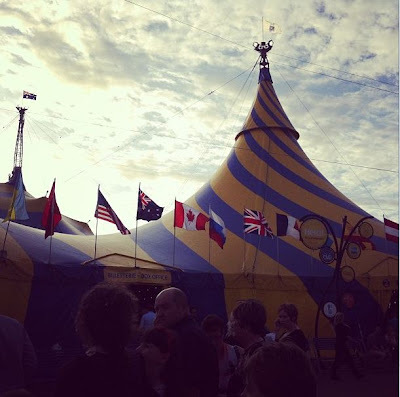 I saw my first, and only, Cirque du Soleil show when I was a kid, during Saltimbanco's first tour of Australia and was completely blown away. To say I was excited about seeing Ovo is an understatement. A return to the Big Top is always a great experience. Being in the somewhat remote location (right at the end of Docklands) meant that finding dinner beforehand would be a little more troublesome. Going to Google for suggestions lead me to a $50 pre-Ovo share-plate degustation special at Oscar's Table by the waterfront. A 5-course degustation with two drinks for $50? I must say that I didn't have high expectations going in, but I didn't have better ideas. My guess was that plenty of people had the same mindset we had, driving up business to the restaurant quite significantly. Sitting outside of the restaurant, sheltered from the strong winds, overlooking Docklands was fairly special in its own right though. Sparkling wine kicked the atmosphere up a notch, even if it wasn't particularly good wine. Maybe my tastes are just that little more expensive than they were before. Having a pre-set menu and a strict booking policy for the degustation meant that the restaurant was well prepared for its diners and food each dish was promptly served. The first course was an Asian-inspired Yellow fin tuna tataki with sesame, wasabi mayo and pickled radish. The seared tuna was decent, although not super fresh, and the servings were generous for two people. The flavours melted together quite well but I would have preferred a stronger wasabi kick. I was pretty excited when the next course arrived - I'm a sucker for deep-fried cheesy goodness. These morsels were fairly strong in flavour but hadn't crossed the line to overwhelming. The coating was well made, if not particularly stunning, but overall digging into these was a please. The next course was just as good. Perhaps it was the combination of seasonings, but with every bite of these recalled my university days when I would happily dig into bowl after bowl of packet mee goreng. That stuff is addictive although probably very, very bad for your health. I'm hoping that these are a lot better for me health-wise (there's at least protein). They were gooey and crunchy all at the same time and the highlight of the meal for me. Moving on from the entrees to the main required a change in drink. Nothing special here, but it's the house red so you can't expect much. It's definitely better than vinegar though. The Rib-eye for the main dish was well cooked although a little stringy at times. The chips were deliciously crunchy. The dishes at Oscar's Table remind me too much of junk food - first packet mee goreng and now a Big-Mac with Nando's chips. It was the cafe de Paris butter which tasted exactly like Big Mac sauce, and the peri-peri style seasoning on the chips. My taste buds were a left a confused: I was eating restaurant-quality food that reminded me strongly of fast food, just with better texture. Befuddled, we reached our dessert. The waiter said it was a carrot cake though, and indeed, that's what it tasted like to me. Not a bad rendition, being sufficiently dense and moist, but I like to think I'd be able to bake up a better version at home. The coconut meringue stuck annoyingly to the teeth though and I think the dish would have been better in its absence. We had a good time at Oscar's Table, and here what you pay is what you get. The food is generally good here, but not the top-notch quality that would have made the experience even more memorable (and which would have bumped up the price to $100 per head). Some of the flavours did seem strange, but perhaps that's my personal food associations rather than a true reflection of taste. Service was slightly lacking at times, but the manager there is very attentive and competent making the experience very enjoyable.